At the Treasury you will find two new folders on BATTERIES OF THE HAURAKI DISTRICT. 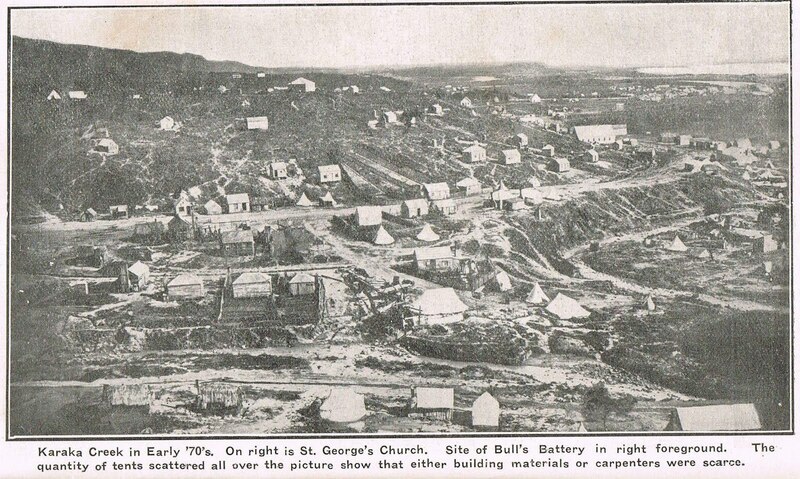 A work in progress aimed at gathering information about the stamper batteries that existed on the goldfields. A growing resource gathering what information is available, where to find photos and details on the batteries. It has been a massive learning curve! Family researchers often find it hard to find out info on their relatives mining endeavours, hopefully this is a start to making the process easier. The key being, that we welcome contributions from anyone who may have information on batteries (and also Claims and Mining Companies). 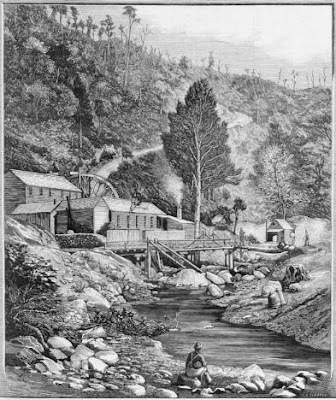 Machines called stamper batteries, which crushed quartz into powder, were set up in the Coromandel ranges. Most mines were steadily producing ore, but the recovery methods were highly inefficient (only 45% of the gold and barely any silver was recovered). Here are the batteries A - B gathered so far. ﻿ A side effect of having all these batteries and all the potential GOLD was robbery!! The papers have examples of attempts both successful and unsuccessful of gold robberies. 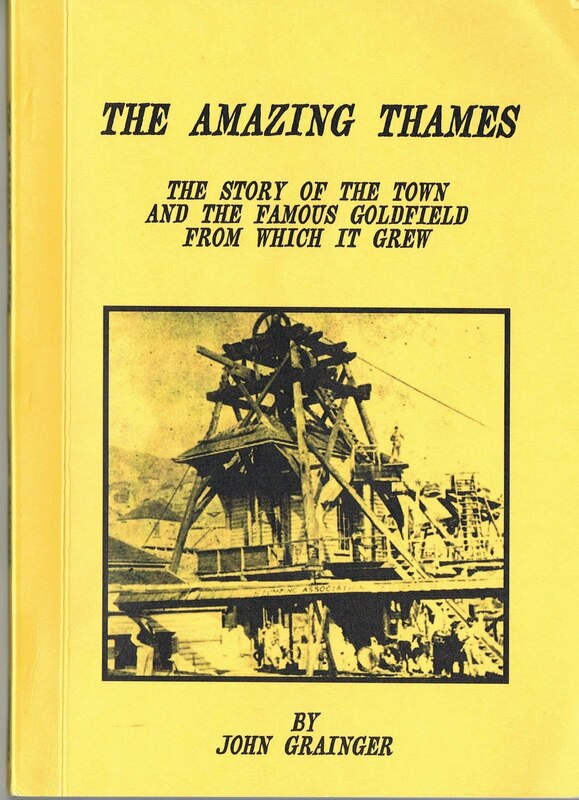 "The first Mill erected on the Thames Goldfield was called the Great Expectations. It commenced working about November 1867, and consisted of four wooden stampers, shod with plates of iron, the whole worked by a donkey engine. The machine is not now working, it having given place to larger and more efficient machinery." There have been many excellent books written on Thames that are of interest to those with a history and genealogical interest. An old list that I assembled is available here. Also The Treasury has a list of just a few they have available and the Thames Library has a searchable catalogue. 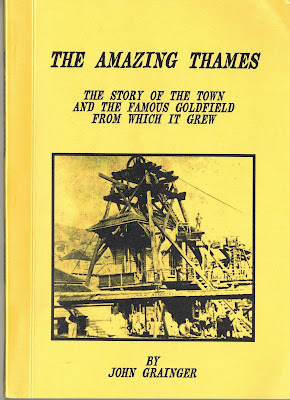 John Grainger's book is a particular favourite, he was passionate about the preservation of Thames history. An article about Grainger is online at The Treasury. A list of Thames street names has previously not covered an alternate name for Tararu Road, Thames. At Papers Past there is mention of O'Neill's Esplanade and it appears to run along the waterfront from the Brown Street area to Tararu. There was discussion in 1874 about extending this esplanade to Shortland Wharf. Interestingly there is also mention of another esplanade called Brodie's Esplanade, part of the Waiotahi Road, just above the Golden Age Hotel. 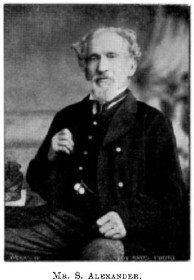 [Charles O'Neill] moved to the Thames district in 1868 where he was appointed a mining surveyor for the Thames goldfield and engineer-in-chief of railways, tramways and wharves. He designed the goldfields' tramline. In 1869 he was appointed provincial engineer and chief surveyor of the goldfield and the same year was made a justice of the peace. 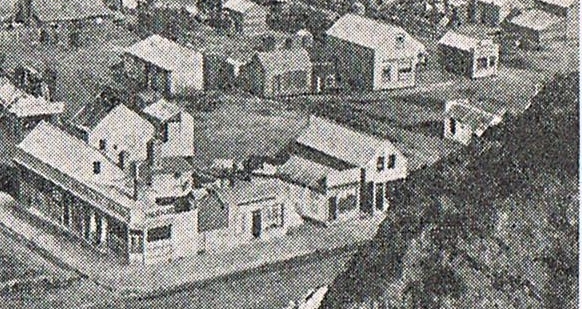 In 1871 he surveyed and reported on a proposed railway route across the Rimutaka Range. In 1874 he was a member of a royal commission which inquired into a boiler explosion at the Kurunui battery on the Thames goldfield in which three people were killed. 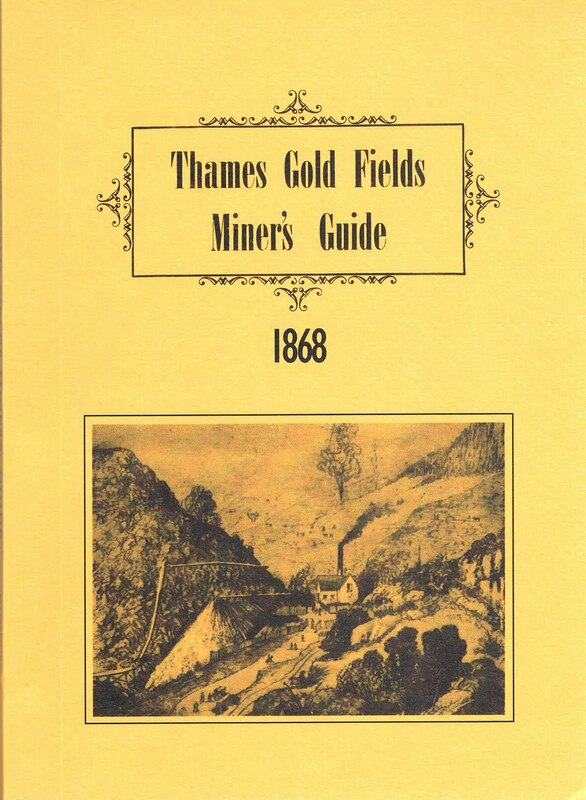 From 1866 to 1870 O'Neill was MHR for Goldfields, Otago, and from 1871 to 1875 represented Thames. His main legislative concerns were the provision of reserves, the widening and regulation of streets, and that all plans of towns should be approved by the governor before land went up for sale. Many of the miners were immigrants from other countries which included England and Ireland, with many of us descended from Cornish miners. Some came alone and others with their families. Life was tough during those early years after the field opened in August 1867. Maybe they lived in a tent, punga whare or were lucky enough to live in a small miners cottage. My maternal grandmother's Grandfather, Great-grandather and Great, Great Grandfather all arrived in the 1870s, with their families. The Vercoe's lived up to the left of this photo, in Hill Street, which was part of Block 27. As the rain falls today, spare a thought for what the living conditions would have been like for the families of the early goldfield years. 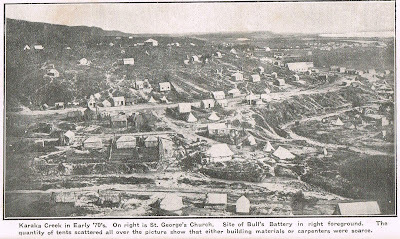 Researching the mines of the Hauraki District is a definite reminder of how little I know on the topic, but also the magnitude of the mining operations that were taking place all across the Coromandel Peninsula in the pre 1900s. "In the month of July, 1867, Mr. Alexander was on the Thames, and found his way up the Kuranui Creek, then surrounded by dense bush, including supplejacks. Having discovered a small waterfall about 10 feet high, he climbed to the top and scooped up some of the loose stuff. This he carried out to the open, and on panning off the dish, discovered a rich prospect of gold. The prospect was immediately taken to Auckland by Mr. Alexander himself, and when crushed there by him, it yielded 21 pennyweights of gold. On this circumstance Mr. Alexander based his application as the discoverer of gold. 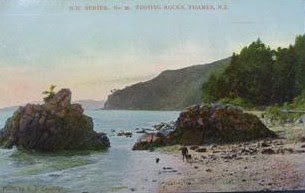 The ground on which he found specimens was afterwards well known as Hunt's Claim. Mr. Alexander afterwards alleged that it was originally arranged between Hunt, Clarkson, and himself that he (Alexander) should have a full share in the mine as the fifth shareholder in six men's ground, but that Hunt had sold that share to other persons before Alexander had had time to register his interest. " Mr S Alexander, 'Father of the Thames Goldfields"
A review of the information on Thames Hotels has been completed, with the discovery of yet more hotels!! The licensing committee minutes that were published in the newspapers make interesting reading, with many applications refused. Obviously everyone wanted to own a hotel, the gold was gone in many cases - so a career in the hotel business possibly seemed a great alternative! At The Treasury are 2 new folders devoted to hotel/publican news via the Licensing Committee meeting reports that appeared in the 'Daily Southern Cross' and 'Evening/Thames Star' Newspapers. These have been indexed and cover hotels all over the peninsula, not just Thames. To accompany this new folders are being established that have an updated summary for each hotel (too many pages to go online), and a space where future articles/news about the hotels can be filed. Do you have any family connection to a Hotel in Thames? - if so I would love to hear from you. Particularly from the 1920 period to present day, so that publicans names can be added. Any photos? Please let me know or leave at The Treasury, Thames. The CROWN HOTEL (pictured above) opened c1868 and closed probably around 1878, when the property was put up for auction and sold for 75 Pounds. Early publicans were: David Barty: Licence 30/6/1869 (License to 10 o'clock); John Harris: 1869-1872; J Cook: Years include 1873. A few new articles online via The Treasury website. Kae has updated the page on the old soldiers of Thames. This includes the KOPU HALL HONOUR BOARD (photo and names) and also expanded the area for men who served in other wars. This includes a new link to information on men who served in the BOER WAR. There is also the full article on MATRONS OF THAMES HOSPITAL. An amazing group of women, who dedicated themselves to the service of their patients and the hospital as a whole. The section of Queen Street in the centre, with Cochrane St running top to right hand side.